Hanson Logistics have a range or repackaging and blending services that meets most needs. We can transfer Hazardous and non hazardous liquid, solid, powder even temperature controlled products at ease with our highly skilled team of staff. Using trading standard approved weighing systems and a range of mechanical systems for mixing and stirring we can blend multiple powder/liquid products into a master medium to achieve a mid stage or final stage product. This can then be transferred into small packaging or even into big bags (FIBC) or 1000 ltr containers. 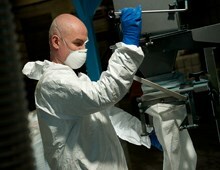 We also have the facility to repack a range of products into packaging to meet your sales needs. Our repackaging department uses the latest technology in dust extraction following a recent large investment in a LEV system (local exhaust ventilation). The staff within the department have been with us for many years so you can be assured that a professional and vastly experienced team will be taking care of your product. Our range of services is such that we can handle Liquid, solid, powder and temperature controlled products that range from non-hazardous products to most hazard classes including corrosive, flammable or toxic material. Some of the systems that we use are an automated bag filling machine that weighs out the product from a 1000kg hopper into a measured size of smaller sized sacks/bags, a blender agitator to allow consistent liquid product mix and we also have a gravity fed large bag filler that allows us to place single or multiple products into bulk packaging. Through innovation and/or investment we can handle almost any request be it into a poly or steel drums through to stitched or impulse sealed bags.